​Documenting the journey with just a click and a pic! You're doing all of the right things for meaningful mathematical instruction! You're teaching through powerful and meaningful context by using rich problems from children’s lives. You understand your students' needs and developmental processes. You use dynamic, formative assessments! As you know, it's important to document each student's developmental journey. How do you document this journey? Your documentation is probably time consuming and most likely involves lots of paper work. Your time is valuable and your knowledge is resourceful! Documenting this journey no longer needs to be so time consuming. We have a way for you to save time and deepen your knowledge of your students' development. It's time to go paperless! With New Perspectives on Assessment, you can easily document each student's strengths, struggles, and journeys. 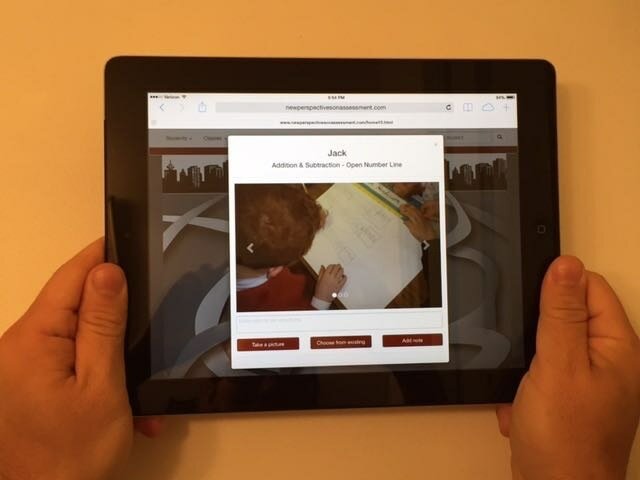 Use your iPad or tablet to capture photos of students' work, expressions, and ideas. Choose a landscape, click on a landmark, and document the journey by adding a picture and/or notes. Group your students for even easier documentation! It's quick, it's easy, and it documents real learning and the Standards of Mathematical Practice with just a click and a pic!